This is what our Facebook friends would call ‘Throw-Back Thursday’, except that this isn’t Facebook and it isn’t Thursday. 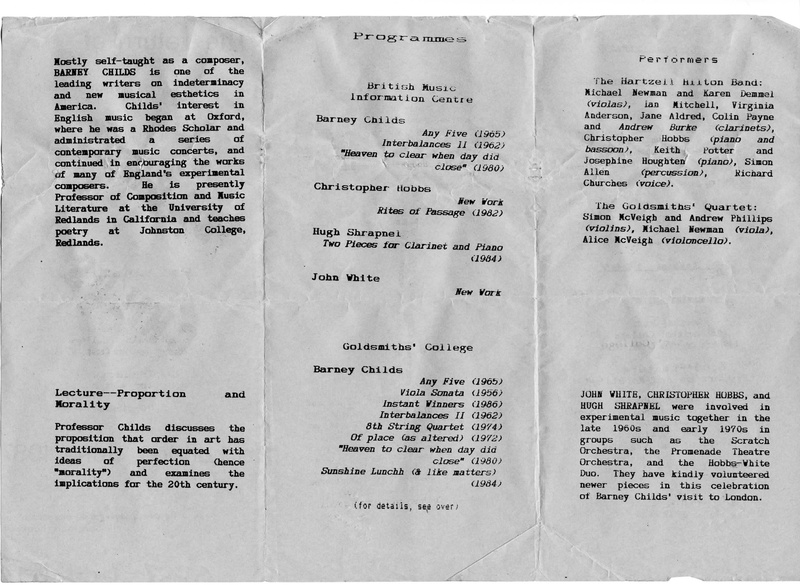 Last week we found some materials relating to the Hartzell Hilton Band, a group that existed in the late 1980s, playing music by Christopher Hobbs, John White, Michael Parsons, Hugh Shrapnel and others. The Hartzell Hilton Band was a quirky little ensemble, consisting as it did of two E flat clarinets, two violas, mallet percussion and piano. The name came from Barney Childs’ nickname for his house on Hartzell Avenue in Redlands, California, because so many composers and performers came to visit. 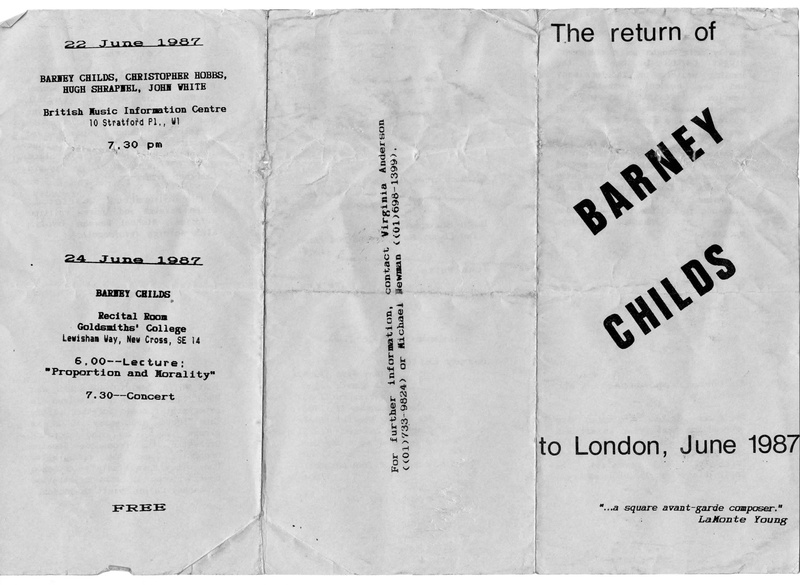 The front (right third of the picture, above) includes a quotation from La Monte Young: ‘…a square avant-garde composer.’ This was one of Barney’s typical anecdotes about himself. One of his students was Joseph Byrd, who later worked with Young in Fluxus (and still later became an alternative rock star). Byrd had said that when he mentioned Barney, this was Young’s assessment, which tickled Barney quite a lot. 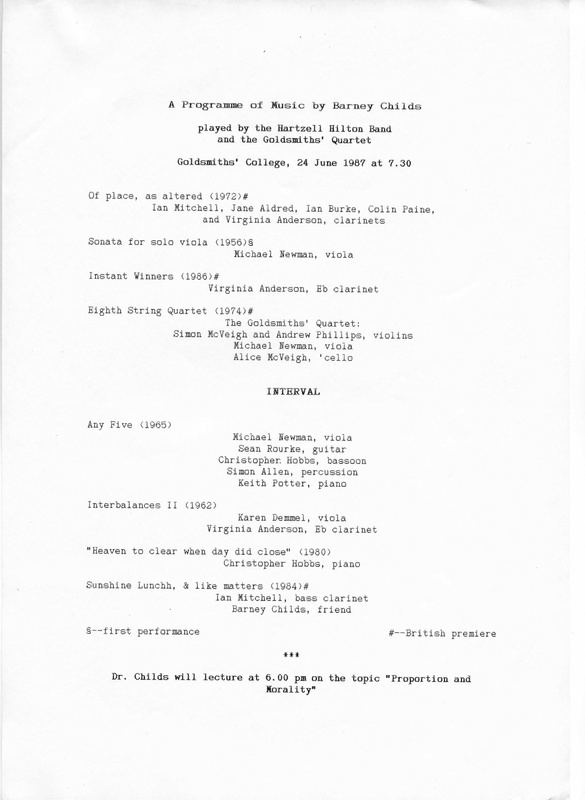 At Goldsmiths, the concert was preceded by a lecture by Barney Childs, befitting the academic setting. In this brief flyer, the performers for both concerts are listed (right third, above). As I remember it, the Hartzell Hilton name was created to distinguish other players on the Goldsmiths concert from the Goldsmiths quartet, which was performing his 8th String Quartet. Thus, for this one occasion, the ‘Hartzell Hilton Band’ was anyone who played on the concert in the other pieces. The concert began with Childs’ 1972 ‘quiet’ minimalist piece, Of place, as altered, a rather glorious subtone clarinet quintet. The viola sonata, played by Mike Newman, was the earliest piece on the programme, and has the kind of American concert music sound of that era. I played Instant Winners, which Barney had written for me the previous year. This was my first performance of this set of little pieces originally written for my amusement (and because of my fascination with the little sopranino E flat clarinet), but it wasn’t the premiere, as James Chavez has premiered it in the Midwestern United States the previous autumn. This was followed by the 8th String Quartet. Barney had written extensively for the ‘normal’ chamber ensembles in the 1950s, and this was a later addition. After the interval, came Any Five, which is, perhaps, Barney Childs’ greatest hit. This piece, for five performers in categories such as woodwind, voice, percussion, brass, and string, is indeterminate and in mobile form, in that certain decisions by performers indicate the progress of the piece from one section to another. It also contains some extended techniques and some theatre. What people usually remember about this piece is that it includes a cue given by throwing a tennis ball out toward the audience, and the final cue, the spoken word, ‘Consider’, that ends the piece. Interbalances II was one of a series of that name exploring elements of indeterminacy in small groups. This piece was for viola and one other (any other). In this version, I played the ‘other’, commenting, part on E flat clarinet. Heaven to clear when day did close was a piano piece using the kind of jazz-based quiet presentation common to the style of younger Southern Californian composers. Sunshine lunchh, & like matters was written by Barney for his duo with Phillip Rehfeldt, Clarinet & Friend. It is in some ways a deeply personal piece for Barney, and in other ways just a great fun romp. The bass clarinet part is pretty clearly marked, but the ‘friend’ part is a kind of self-assembly with some fixed items. For this piece, Barney wore a wizard hat and waved a wand, while reading quotations from readings that either impressed or amused him, and ending with a full-throated rendition of ‘Rolling Down to Rio’. If anything, I remember that Ian Mitchell’s performance was better than other bass clarinettists. Next time, I will share the BMIC concert, which has some notable differences. And Barneys wizard hat was flourescent pink with ‘Mystic Symbols’ written down the middle – worn whilst holding up a “botanical” (daffodil). Hey, that’s right! Good memory, Simon! That must have been for the Goldsmiths concert! On his other concerts the hat was a kind of vague pink/peach, and his wand was a dried desert plant. But I bet Barney didn’t carry that to England, hence the daff!